As Salesforce.com ISV Silver Partner and integrator on the force.com platform, Apsara Consulting supports national and international companies in the implementation of On Premise applications such as SAP ERP for Salesforce or from cloud solutions like Google, Amazon or Microsoft. The platform architecture revolutionizes Salesforce integrations by moving the integration processes to the Salesforce platform. This provides you with a central, enterprise-wide Salesforce integration platform for automating business processes and a comprehensive solution for data integration and synchronization. The SKYVVA Integration Cloud is available as a subscription model. Companies that are profitable in their business must continually adapt to market and customer requirements. From the back-end system to global organizations, from purchasing to warehousing to logistics, from the central PC to the mobile terminal, the SKYVVA Integration Cloud enables people and organizations to work more efficiently and comprehensively and make more effective use of existing business information. International and medium-sized companies therefore rely on the SKYVVA integration solution in order to achieve their goals as best as possible. 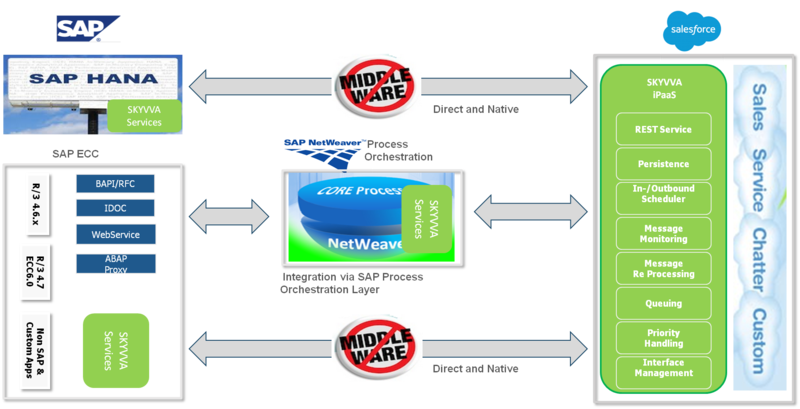 As a certified SAP partner, we advise companies on all aspects of the SAP NetWeaver platform. Strategy, architecture and the implementation of complex SAP NetWeaver landscapes are among our strengths and corresponding services. We can contribute our expertise to extensive SAP Salesforce integration projects. We were looking around to find a solution for automatic data processing to our database and we come across SKYVVA as it was mentioned in the Gartner Magic Quadrant and voted as Gartner Cool Vendor 2012. We built different data synchronization scenarios between our database and Salesforce in both direction. There is no more data inconsistency between our legacy and Salesforce Cloud. Building interface takes few hours instead of days. Graphical mapping editor allow you to transform data without coding. If you need complex business transformation use Salesforce formula. It's easy and provide all kind of function you need to do data transformation. We need not worry about governor limit as SKYVVA is smart enough to handle this for you (as the are on Force.com platform). All data sync. pattern are supported (e.g. synchronous, batch or BULK mode). What we love is the message board and and end-to end monitoring capability. This is really helpful in case of troubleshooting errors. You can do payload based search to find all the messages that were sent as updates for a key field. You can find out the root cause for any error occurred in minutes instead of days. This is what cuts your OPEX cost! I'm leading the competence center Cloud Integration at our consulting company factory42 and we are using Skyvva Integration Cloud App in many of our projects for an easy integration of Salesforce with backend systems (ERPs, databases, ...). 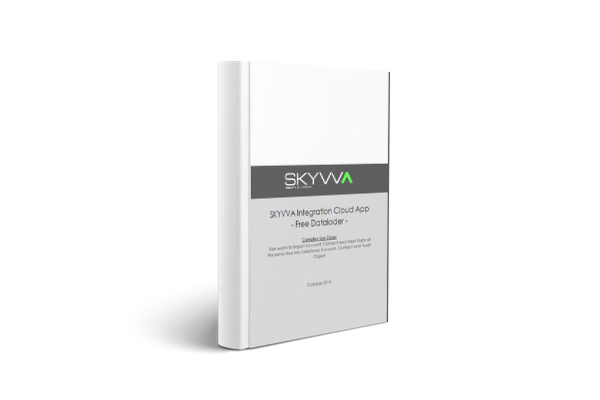 The great advantage of Skyvva Integration Cloud App is that it runs natively within Salesforce, so no installation and monitoring of additonal servers is required. It has a message queue and error logs out of the box, so you can easily monitor the integration right from within Salesforce without extra development and - when for example some records run against a validation rule because of bad data quality in the source system - you can easily modify the data and reprocess the message with one click. Because Skyvva Integration Cloud App is not a middleware product but a Salesforce app, this is not the right tool if you have a large system landscape and various systems need to exchange data with each other. However, if your main intention is to integrate Salesforce with various backend systems it is a simple and perfect cloud-based solution. We have successfully connect many our customer from database source, file, ftp to Salesforce using SKYVVA Data Connect. With Click & Point we are able in hours to set interfaces live. 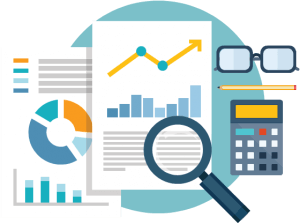 The graphical mapping tool allow us to do complex business data transformation using Salesforce formula and if even use apex code to get data from anywhere with any complex logic. What is amazing and save a lot of cost is the message monitoring capability of SKYVVA Data Connect. It help you to find out errors in minutes instead of hours or days. If something goes wrong you don't need any more to dig into the Salesforce Debug Log and search for cryptic error description or exception. The message board show you the message content and all the error which occurs during integration. You can find easily the root cause, correct the data and do reprocessing. This is the real power of SKYVVA in comparison to other tool which just only use data pushing and no error handling, monitoring and reprocessing functionality is out of the box to support your daily integration operation. Support is excellent too. Just put a mail to Skyvva support and you are helped in a very short time. 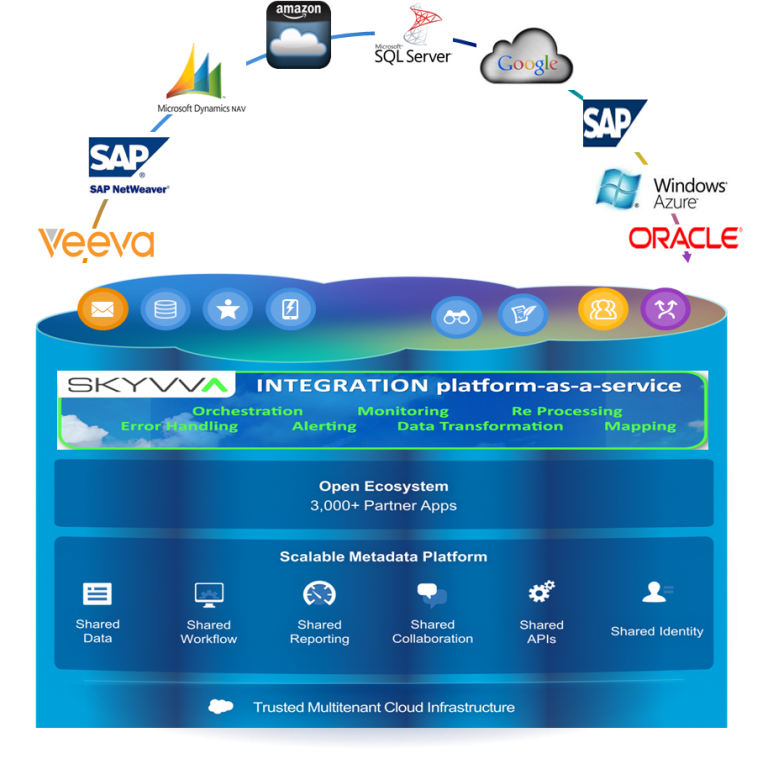 SKYVVA´s Integration Cloud App makes the traditional middleware approach obsolete and lays the foundation for a service oriented architecture. With cloud managed integration services we could take advantage of the business value of cloud computing also for integration which was considered a costly, time consuming and risky task in the past. With pre built integration apps, time-to-value is quick and complexity cost is low even when integrating SAP. I was able to import data for multi-tier custom objects in one shot and it only took me an hour or so to build. The VLOOKUP function made it all very easy. In the past it would have taken me days! Plus - the support was fantastic. When I did have a question the response was fast and easy to understand.